This summer we’re joined by a number of amazing interns, who are doing everything from researching how to better print quality to making sure our analytics and website are working splendidly. I work with the engineering team to test and repair printers that are down on their luck. Whenever a printer is having problems, we need to understand exactly what went wrong, so that we can roll out fixes and make sure everything is going smoothly. With a little problem solving, we can get them up and running again pretty quickly &ndash; we show them off in tradeshows, or use them for R&D or printing sample parts. I also try to help out with all sorts of experiments around here, sometimes the engineers need a hand and I’m always eager to see what’s going on. The very first Form 1+’s were just coming off the factory line when we had our launch events, so the first 20 Form 1+ printers that made an appearance at all of our launch events were hand-built right here in our offices. I was part of the team that put them together. We stripped down Form 1 printers to their frame and rebuilt them with new components, like fancy new galvanometer drivers and more powerful lasers. During the process, I designed and printed a custom spacer that ended up being essential to the transition. The spacers were printed on a Form 1, so I like to think that I empowered the Form 1 in the birthing of their Form 1+ brothers. Snacks. Most definitely snacks. Plus, a pretty huge portion of people here are super athletic so everyone is on the ball about eating a lot and often. Snacking to the next level. 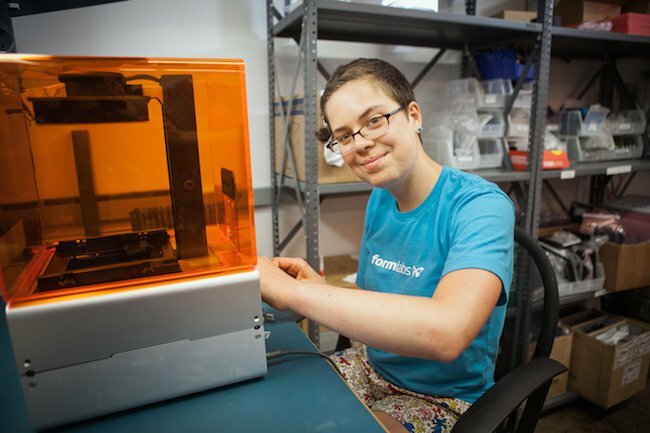 Want to work at Formlabs? Join one of the biggest names in desktop 3d printing here.